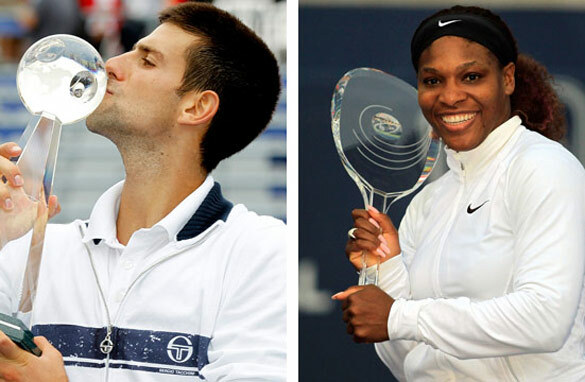 Can anybody stop Djokovic and Williams at the U.S. Open? Novak Djokovic and Serena Williams pose with their Rogers Cup trophies. There are two weeks to go until the final major of the year begins and already we have two huge favorites. You simply cannot look past Novak Djokovic on the men’s side and Serena Williams on the women’s. The Serb’s run this year been absolutely astonishing. Victory at the Rogers Cup in Montreal was his ninth title of 2011 and his fifth at an ATP Tour Masters 1000 - a record - which means he has now won 53 out of his 54 matches - with that lone loss coming to 16-time grand slam winner Roger Federer in the semifinal of the French Open. Not too long ago it was Rafa Nadal and Swiss Federer who dominated men’s tennis and Novak was a bit of an afterthought, but how things have changed. While Djokovic cruised unchallenged to the final in Montreal in his first tournament as world number one, Rafa lost his first match and Roger his second. Novak has clearly separated himself from the crowd, while the other two, especially Federer, appear to have been reigned in by the field. If this was the Tour de France, Djokovic would be pedaling clear of the breakaway while the peloton would be slowly sucking Rafa and Roger in. As for Serena, well what can you say? She was the crash victim and struggling at the back of the pack after 11 months out, but is now flying towards the front at a rate of knots. According to Serena herself, she was on deaths door earlier this year and, rumor had it, her career was close to being over. But we have learnt over the years never to rule the younger Williams out. As she told me herself at the women’s Rogers Cup in Toronto, she never thinks she will lose in a match, no matter how far she is down. Lots of players say that, when she does, it’s true. She has now won two of her four tournaments since returning to the WTA Tour and is thriving on the North American hard courts, which bodes rather well for her chances at Flushing Meadows - where she has won multiple times before. From being ranked in the 80’s, Serena is now up to 31 in the world and it won’t be long before she is into the top five where she belongs. The big names will hope she is given a top seeding in New York, because the truth is no-one wants to face a fit Serena. Djokovic is unbeatable, as if there is a curse of unbeatable Djoker for any opponents who pushing or on the verge of beating him fall short to close it out. Of course it's Djoker's greatness that makes it happen, not kind of luck or fortune at this level of winning streak. If there is one Achilles heel in Djoker, it may be Mr. Roger Federer, who only has the answer for Djokovic so far this season. The more Djoker wins, the Bigger only one defeat to Fed might be, and it could be the curse for the Djoker. I think Serena's lack of match play will eventually catch up with her. As for Novak, unless he starts to doubt himself, he should win his first US Open as the hardcourts clearly favor his playing style. Nice article. I think the only one that has a chance again Djoker at the US Open is the only one who has beaten him this year- Roger Federer. It's arguable but I think US Open hard courts are his best surface and he has the game to take Djoker down. On the women's side I like Li Na and Kvitova to give Serena a scare but in the end the home crowd should help an in-form Serena win. Nadal will win this year, you wait and see. I agree about Novak. It must be his year and he certainly deserves it. Williams I am not so sure about.I do like to read your blogs! There have been some really notable games recently in Montreal; the Djokovic/Monfils in particular. It was played in such a good spirit – I and the crowd were in stitches; what a joy from the doom and gloom of others. Amazing Nadal and Federer were ousted so early, but at least they tried; but oh dear, what does go on in Murray's head – excuse after excuse – we are all getting tired of it. He had six people in his box this week and still he was berating from the back of the court – perhaps he should try a day job!!! Serena has shown that she's still near unbeatable when she plays her best tennis, but it's too early to say whether she can do that for the full 2 weeks in NY. She pulled out of Cincinnati ostensibly because of her toe, but I think it's more likely she was feeling the heat (literally and figuratively) and didn't like her prospects of beating Stosur, Li and Sharapova on consecutive days just to get to the semis. She clearly struggled in the heat to close out her match against Hradecka, while at the same time the considerably fitter Stosur looked like she was taking a stroll in the park on an outside court. In short: I wouldn't bet against her, but she's far from bulletproof. Backing the obvious favorites is hardly incisive journalism but I agree that it's hard to see past Djokovic and Serena. That's ok for the men's draw because although Djokovic is the favorite there are 3 or maybe 4 players who could stop it from being a foregone conclusion, but it's a disaster for the women's tour as it shows the other players did not gain any ground during Serena's long absence. She's still the most likely to win any tournament she enters and it's high time she had a serious rival. Unfortunately, with the exception of Clijsters, who's just pulled out, the rest of the girls are pretty mediocre. Serena Williams is truly a force again now but we're just all supposed to ignore the obvious? Blood clots, premature body break down, ridiculous muscle gains, returns that gravitate around system cleanses. These reporters just go on as if this isn't the single greatest scandal ever to hit women's tennis. How is it that every time, without fail, when showing a putt in golf, the hole is always hidden behing the logos or news feeds on the screen and the shot is always missed. Producers, you need to get your act together. this has been going on for as long as I have watched the game, and it is about time you realised what you are doing. Djokovic will lose in the early rounds. If not then I do not think, he can beat murray in the semis. And he wont have other opponents. Djokovics good times are over. I expect a Nadal_Murray final with Nadal taking the title. Djokovic is going to stop himself. I want to see Djokovic and Tsonga in the US Open Final...All the best you guys....For the ladies I want to see Serena to lift the cup...I'm a Biggest Fan of Serena...all the best..God Bless You:-). I think Novak is in the form of his life.Defeating Nadal shows his got quality.He is world's no 1 but we must not forget too quickly the strength and finessee of Nadal,he is the defending champion and I expect to see fire works from him.Roger also is a master of the game.I tip Nadal vs Murray for final with Nadal carrying the day. Regarding Williams outburst: You guys should at least make comparisons between McEnroe and Williams and see who was worse. Leave Williams alone, she's worked hard and if she calls out one of the refs, then maybe its like Kobe or Jordon calling out the refs. They get respect because the level they have achieved in sports. Not saying what Williams did was right, let's just tone it down a bit. Throughout this great US open in which we saw so many games extend three hours and the finalists playing in pain, I could not stop worrying that one of the players would collapse of exhaustion or worse. Football and soccer players get to take a break, yet some still get in trouble by extreme heat and heart rate levels. Why not allow, let's say, a ten-minute break every hour? I understand that the scheduling and the economics of the game would suffer, but I would think that the players' health and longevity are more important. Has anyone ever thought of that or are the rules so written on stone that only the death of a player could affect a consideration of change?